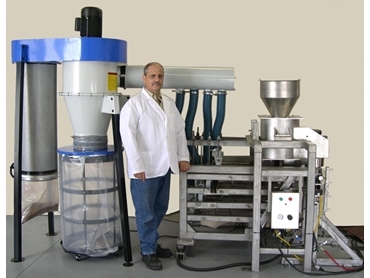 Arrow Scientific presents the Small Scale Winnower, a food processing, cocoa bean dehulling system designed and manufactured by Bottom Line Technologies. In cocoa and chocolate manufacturing, the dehulling of cocoa beans is a very significant process. The most important part of dehulling is to prevent nib loss, which is the most valuable part of the cocoa bean. The Small Scale Winnower, food processing equipment, dehulls the cocoa beans with clean separation of the nibs and the shells. The Small Scale Winnower features four screens, which allows customers to specify how they would like the cocoa beans – roasted or raw – a screen raking system, which helps maintain the flow of product through the screens, and a vacuum system that collects all the shell debris. The Small Scale Winnowers are available in Australia and New Zealand from Arrow Scientific with optional bean loaders.